The BALi food plan was developed by Dr. Roby Mitchell, M.D. (read his credentials). 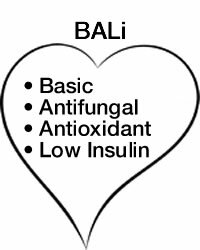 BALI stands for: Basic, Antifungal / Antioxidant, Low Insulin. The list can be downloaded from Dr. Mitchell’s Dr. Mitchell’s Website. My notes: I am an avid reader of health articles. I believe that nature provides us with the answers we need for perfect health. I don’t believe that we can medicate our way out of a health crisis that we have behaved our way into. I have learned a LOT from Dr. Roby. I have been privileged to meet him and I like his authenticity and humility. There are so many factors involved in being healthy – not all of them are lifestyle related. We are complex beings and each of us has differing needs. No single diet will ever work for everybody. That’s why I love this program. The Food list was compiled through years of scientific research. Your objective should be to REDUCE inflammation, balance your Blood Glucose, and improve your IMMUNE response. Empower your immune system by CHOOSING powerful foods that provide real nourishment for your cells. Please let me know how I could support you in reaching your goals. It does not have to be difficult. Dr. Roby often says: consequence is no coincidence. There are consequences to human meddling with our food supply (GMO’s) so I fully recommend eating Organic foods.